John died so very long ago that it's hard to recall just when - 1962 or '63. John always loved cars. He was the sort of kid who said he wanted to grow up and be a mechanic, rather that a driver. For years he'd planned and saved to buy an MG, and he finally was able to get one - a "C" model. When he finished with it it was pristine. 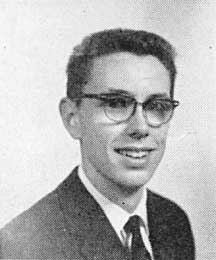 John was attending the University of California at Riverside at the time of his death. While I never knew him to take an art class in junior/high school, he had a tremendous talent for painting, and he was using that to develop maps as part of his studies to complete a major in Geography. One night he was returning to the Riverside campus following a visit home to Westwood. He was driving with his seat belt on (remember...those were the days when only the geekiest of us wore them). He drove under some unlighted roadway overpass construction, turned right - traveling, it was calculated, about fifteen miles per hour - and ran in to the rear end of a car that had been abandoned, out of gas, in the traffic lane. John was so tall, at 6'-5", that - even with his lap belt fastened - only professional drivers had realistic access to shoulder belts in those days - his head went forward and struck the top of the windshield. He died early the next morning. Those of us who knew John will always miss him.